Master / duplicate items is one of the key methods in LTrace to help manage a large number of identical or almost identical items. This screen also shows the list of duplicated items. The name of the item should also have [Master] at the end of its description. then you are looking at the duplicated item. Pressing the “View” button will then take you to the master item. You need to be editing the master item. 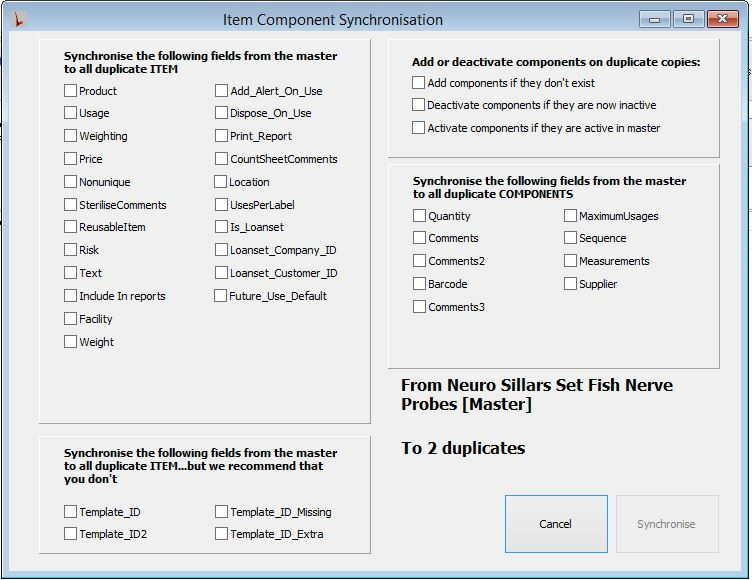 The “Components” tab has “Synch Duplicates” on the side panel. The “Duplicates” tab has the “Synchronise Copies” button, as shown in the first screen shot above. The check boxes determine which fields will be synchronised. The boxes on the left synchronise information relating to the actual item. The fields on the right are the fields relating to the components (instruments) on the item. The “Synchronise” button won’t be available until at least one checkbox is selected. If you have added new components you will need to select the “Add component’s if they don’t exist” in the top right box.